After an enjoyable Open Day, where Melissa recalls the lecturers being friendly and enthusiastic, Melissa enrolled on the course and hasn’t looked back since. “The lecturers spend a lot of time with the students on the course, which really helps,” she says. In many universities, the relationship between a student and a lecturer is almost non-existent. That’s not the case at LSBU – you get so much guidance. 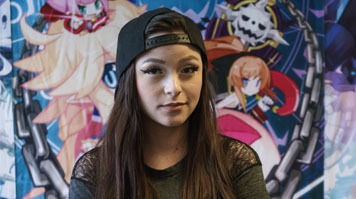 In particular, Melissa found the placement opportunities available through LSBU to be particularly useful – especially given that, although she knew she wanted to work in the games industry, she had not decided on a specific career prior to joining us on the course. Melissa’s day-to-day responsibilities are varied, raging from PR – including social media activity – to ensuring Reef’s games are stocked and distributed by a variety of online retailers. She also writes marketing plans, considers innovative ways to promote Reef’s titles, works at conventions, gets involved with playtesting, and works closely with the media to secure coverage of new releases. My degree helps me though – I can understand the industry from a number of different angles – and even though my current role is mainly focused on marketing, it is good to have an understanding of what goes on elsewhere. Find out more about the School of Arts and Creative Industries.